Autumn and winter are great times to see the many abandoned millstones that are scattered beneath the famous gritstone edges of the eastern Dark Peak. During the summer months these iconic features tend to be hidden from view by bracken which grows prolifically in the area. Millstone production, along with lead mining was one of the main medieval industries of the Peak District and the two main centres of production were above Hathersage and Baslow. Production is believed to have started as early as the 14th century, reaching its peak in the late 16th and 17th centuries. It was a huge industry. Traditionally the stones were quarried by individual stone masons, each making about 16 pairs per year up on the hillside near to where the stone was quarried. They would then be transported down the hill and taken away by road or river. Peak District Millstones found their way all over the UK. It is thought that the market for our local Peak District millstones disappeared very suddenly mid-18th century when white bread became fashionable. The gritstone of which they were made turned flour a grey colour, whereas it was found that French millstones were capable of producing white flour. 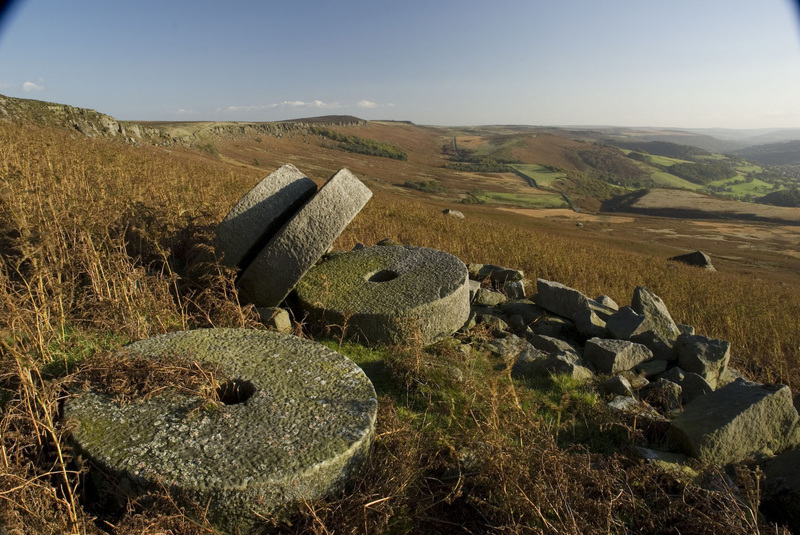 Dozens of millstones in production in the Peak District couldn’t be sold and still lie today exactly where they were produced – up on the hills below the gritstone edges. The industry didn’t die without a fight by the local millstone workers who found themselves suddenly without work. As the French stones replace the local ones in the Derwent Valley, enraged workers attacked the mills and destroyed the stones. It was necessary to bring in military help to restore order. The Millstone is now the symbol of the Peak District National Park. Enter the park on a main road and that chances are that you will see a great millstone standing on a stone mount indicating that you are now entering the Peak District.